Many believe that delivering technology to support products and services is the only reason IT exists. Although that is important, CIOs should also focus on furthering corporate objectives by delivering the right technology at the right time. Equally important is knowing when something should not be delivered because it doesn't align with corporate goals. Many executives don't have the time to fully understand the details of the technology they invest in. As a result, CIOs find themselves filling the role of a technical advisor. As technical advisors, CIOs spend meeting after meeting explaining how specific technologies work and how they will increase productivity. Although such discussions are helpful, they are more suited to a technical director or program manager. As a CIO, you need to elevate yourself to an investment advisor to the executive team. As an investment advisor, prioritizing the correct projects and ensuring you can deliver becomes your focus. However, CIOs also need to stay involved in the delivery process. There is always more demand for IT services than you can supply, so efficient delivery processes are a necessity. ITPM solutions provide the data you need to monitor performance and ensure alignment, which maximizes your return on investment (ROI). Delivering projects on time and under budget has almost become "the grail" in IT. During delivery on any project, IT must adjust deadlines and submit requests for additional funding and approval to handle change requests. Projects that exceed their deadlines result in missed market opportunities and decreased ROI. IT faces some inherent challenges to effective delivery. The existing delivery paradigm uses document‐centric processes and has limited cross‐project visibility—making it difficult to see how multiple projects can impact each other. Trying to track projects in multiple applications leads to a spiral of work, and you can spend more time updating information in 10 to 12 different places than you spend on the project itself. Without the ability to acquire hard data, examine the impact of change on the financial aspects of a project, and make informed decisions, CIOs will always be "guessing" at what the impact of change will be. When you throw multiple projects with different inter‐dependences into the mix, it only compounds the problem. Multiply this by the number of projects in the works, and CIOs will quickly become overwhelmed. Rare is the CIO with only a single project to oversee. Usually, there are multiple projects going on, which need to utilize the same resources and often have dependencies. With finite resources available, you have to prioritize your projects and complete the most important one first. Delivery priorities can even change after a project has been kicked off. So, how can you manage multiple projects when business goals are in a constant flux? ITPM solutions allow you to alter delivery schedules on multiple projects and directly view the outcome. In a situation where resources are scarce, you may be able to find areas where bringing in outside help would allow you to meet all your deadlines. Even if you have to reprioritize your projects, you will have data available to objectively illustrate your decisions. Regardless of a person's role, they will always believe that their project has the highest priority. Staying focused on corporate objectives is difficult for everyone to remember when they are also held accountable for their department's performance. In fact, many managers are actually compensated for performance and are watching their personal profits, sometimes to the detriment of the organization. In order to manage demand through the delivery process, you need a tool to create objective goals with the executive team. Allowing individual managers or directors to prioritize IT projects may seem the most efficient thing to do. However, it can have a very detrimental effect on the business as a whole. Providing business leaders with objective delivery priorities based on shifting business goals will deliver profitable results. The only successful way to maximize your returns is to prioritize delivery so that it is relevant to the business as opposed to the department. For example, suppose you are implementing call center software designed to reduce hold times and allow your employees to process more orders. It's a large project, requiring hundreds of personnel hours for your staff. The surveys and beta tests you and the CFO produce show a 5% increase in top‐line revenue once the upgrade is completed. Halfway through the project, the Controller comes to you and says "we really need one of your top people for two days because we are rolling out a new accounts receivable module." You are already focused on a major project with known returns, and putting that project behind schedule for a new accounting module seems ridiculous. Using your current systems, how could you make the proper resource allocations? What if your receivables were in the millions of dollars with the majority in the "60 day" column because no invoice had been sent? Could you justify delaying your call center project? Without the tools to compare the financial impacts of shifting your resources, a CIO is forced to guess which project has a bigger impact. Even if you can guess correctly, how can you be sure that you are focuses on the business' financial goals? To manage to the business, you must know if the executives are focused on top‐line revenue or bottom‐line profits. With your data in a central repository, you can collaborate with your peers and deliver the right projects in the correct priority according to your current business goals. The CIO and other executives must be responsible for setting the corporate strategies and objectives, whether it is revenue or profit, and applying those criteria to each and every project. As the CIO, you need the right data to shift your resources as corporate goals change. The rising importance of business agility is easily demonstrated by examining some of the large telecomm companies that once dominated the communications industry. During my employment with one of these vendors, I frequently heard the phrase "you can't turn the QE2 on a dime." I was even present when a brand‐new analog phone system was internally rolled out in a 10‐million‐dollar data center, while just across the hall the salespeople were losing more than 40% of their existing pipeline to a Voice over IP (VoIP) vendor. When I asked my engineer why we were showcasing analog equipment, I was told "the VP of operations for the US has been working on getting this for years so that we can impress ACME Corporation and keep their global contract." While the analog system was being installed, another global company who was not a customer was testing our VoIP system. The tests were going poorly and the systems were failing because the top engineers in the country were installing the new analog switch. Adding to the irony, the company's mission statement had recently changed to embrace VoIP. Because the VP in the US had no objective delivery data, he was measuring success by keeping an existing contract and the corporate goal was being ignored. As a result the wrong project was delivered, and while the customer was kept for another year, both customers wound up installing a VoIP solution from another vendor within 2 years. With an ITPM solution, you can eliminate subjectivity and change how, when, and why your projects are delivered and align those being delivered with long‐term corporate goals. But how does ITPM compare with and include the existing task‐based project management systems? Most ITPM systems not only allow task‐based management but also let you manage and deliver on your constantly‐changing projects while continually aligning to the right priorities. I have yet to see a large IT implementation go from planning to acceptance without a major hitch. Resources are constantly shuffled from project to project, budgets are altered as the markets change, and communication gets more and more difficult. And, projects often take on a life of their own. For example, a project targeted at complying with SOX or PCI becomes a security project or implementing new call center software to increase the number of orders taken becomes an entire call center upgrade. Because of these issues, CIOs frequently take their eyes off the original value proposition, leading to late delivery and reduced ROI. Delivering multiple projects on time and within budget can't be done without organizational efficiency. You must have the most qualified people working on projects that are aligned with their skills. I have written previously about highly‐paid IT implementers fixing jammed printers and desktop workstations. ITPM can give you the tools to illustrate the real cost of those activities to the organization. What if the same top‐level engineer could lead three projects as opposed to completing one? What if your project managers could each manage an additional project because they were no longer updating information in multiple locations? ITPM not only alleviates the problems with the current delivery paradigm but also can make your employees much more efficient and increase your ROI. This increase in efficiency is apparent in the delivery process more than anywhere else. Every employee involved in a project can view a single dashboard with customized windows that allow them to focus on the tasks with the highest priority. For example, suppose that over the weekend, your competition issues a press release stating that their new customer service center will improve the quality of the customer experience. Seeing this, the CEO and CFO have decided that the deadline for your own implementation needs to be moved up. So they change the deadline and your customer service project now appears in red instead of green. With a quick phone call, you show them updated Gantt charts and resource graphs, and decide that the security audit can be delayed another 30 days. When the project manager sits down and looks at their scheduled activities, they immediately see that the customer service project is red, so they create alternative scenarios and send three possible schedules up the chain for approval. After another quick discussion with your peers, you select one of these options, and the project manager makes the appropriate changes. The implementing engineer sees the shift in priorities and begins working on the customer service project. At that point, it's time for all of you to go to lunch because you have just accomplished in a matter of hours something that would normally take 3 to 4 days. Better still, you increased the efficiency of your organization while aligning your delivery with business goals. Like communication, the assessment process is something that must continue throughout the IT life cycle. Since the demand for IT services is constantly growing and changing, you need a real‐time view into the value of your IT assets. What if you could view the demand and performance of your company's IT investment on a per‐application basis? This view would make it much easier to understand which applications need your focus. You also need to see application performance and usage trends. A continuous assessment process will illustrate trending information and anticipate business demand for IT services. A subset of ITPM functionality is Application Portfolio Management. APM allows you to gather a consolidated view of your users and applications and how they perform together. In most organizations, the way application performance is measured is by the number of trouble tickets or complaints received by IT. Just about every IT department I have worked with has an application that everyone knows about that is next on the list for upgrade or replacement. Unfortunately, when you wait for application performance to degrade to this point, you have already lost a significant amount of return on your IT investment. The data provided by APM allows you to continuously asses the application portfolio by collecting user and performance data, spot performance trends before they cause large losses, and make sound decisions about your IT investments. Although the relationship between users and applications has many variables, it is possible to measure and track their interaction using ITPM. Surveys and feedback forms allow you to capture users' perception of whether the application is delivering business value. 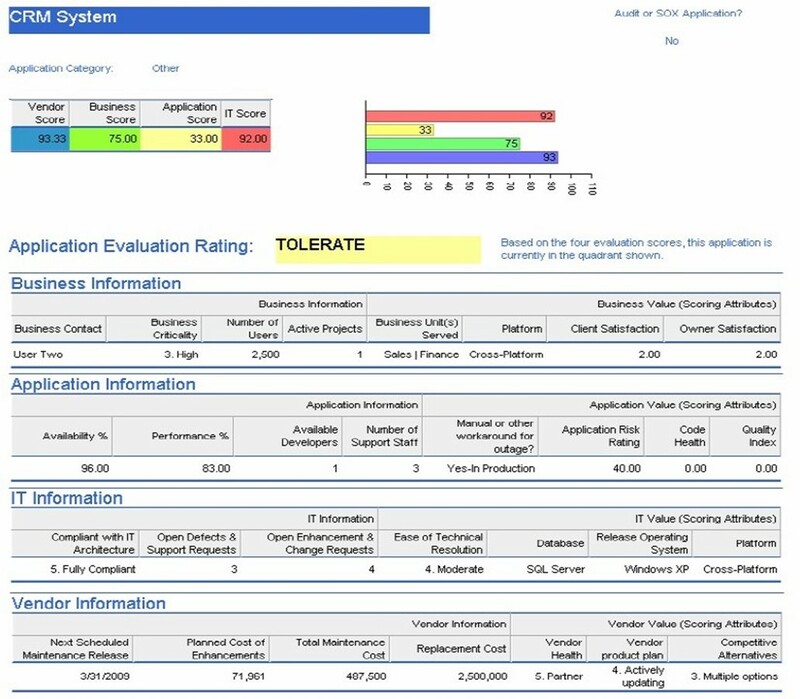 Application scorecards can give you a window into how well an application is running, allowing you to constantly re‐asses its value. When you have the ability to compare user surveys and demand data with application performance, the true value of an application is easy to see. Combining this data on an application scorecard will give you an immediate rating that allows you to quickly make relevant decisions. APM data collection is even more crucial to businesses that are supporting large numbers of legacy applications. Most of these older applications have no built‐in methods to produce reports and performance statistics. Without these metrics, compiling performance data and linking it directly with user surveys and demand requests may be the only way to illustrate to your peers how much these applications are costing the business. Without this data, it is easy for business decision makers to put off an investment decision for yet another year, until the system collapses from the strain and the replacement becomes an emergency. Figure 4.1 offers an example application scorecard. Figure 4.1: An application scorecard. Application scorecards can make or break a company. One of my previous employers implemented a CRM system that integrated with the back‐end accounting software. The pilot project went well, and all 20 of the salespeople were happy with the application. Once accounting figured out how to define what data was available to sales, everyone was pleased with the rollout. As a result, salespeople were more productive, and the accounting department closed months and quarters sooner because customer information only had to be entered once. Two years later, accounting had hired four more employees, and the top three salespeople were no longer using the CRM tool. As the database for the CRM system grew, the time it took to open, view, and manipulate records increased exponentially. When the owner of the company saw performance start to slip, his attitude was "the salespeople can wait a few extra seconds to open a few windows." Since upgrading or replacing the application was a serious investment, it was put off as long as possible. The sales force started using Outlook as a contact management system, and only placed contacts into the new system when orders came in. More data entry positions had to be filled because the data coming into accounting was often inaccurate or incomplete. Because no one was able to illustrate the impact of avoiding the upgrade, the company lost a significant amount of money. Now, 13 years later, it's clear that an ITPM solution would have been able to see usage trends and "connect the dots." If the owner had this data, he probably would have invested in the upgrade. Investing in ITPM can be a risky endeavor. Because portfolio management solutions provide views and analysis for every part of your business, they can require a lot of customization. To help organization hit the ground running, some ITPM solutions have modules that lay the groundwork to speed customization using best practices and predefined metrics. These modules accelerate the process of implementing ITPM, increase your ROI, and rapidly define consistent, repeatable processes. These modules can help you improve your delivery by setting up best practices for your projects. Others make basic assumptions about your financial data and will have prewritten reports for your finance teams. Still others can help you deploy APM strategies such as identifying inventory, automating data collection, and capturing the right metrics in a single repository. These features let you get a head start on an ITPM implementation, sustain the practices, and ultimately change the view of IT from a service center to a financial investment. Utility investments are investments in mission‐critical systems and applications that don't provide an immediate performance increase. Enhancement investments are investments that improve immediate performance and have a clear ROI. Frontier investments are investments in future capabilities with a higher risk and potentially higher return. Just like a financial portfolio, IT investors should have a balance of these three investment types. Unfortunately, a CIO doesn't have the option of picking up the phone and calling a "technology broker." Managing IT investments falls squarely on the CIO's shoulders. Additionally, investments in IT will migrate from one category to the next as fast as technology can change. Categorization approaches like the previous example are also available in accelerators provided by vendors. Once you have classified your projects, you can focus on delivering the highest return. Does it make more sense to allocate your best resources to utility or frontier investments? The answer will most likely change with the competitive landscape. However, current methods for collecting and acting on this data are too slow. You need an ITPM tool to collect and illustrate your delivery data if you want this level of business agility. In order to speed the process, these tools need to be based on industry standard best practices. Organizations such as the Project Management Institute constantly release standards and updates like the Project Management Body of Knowledge. PMBOK illustrates best practices and allows organizations to adopt processes that have already been used successfully. 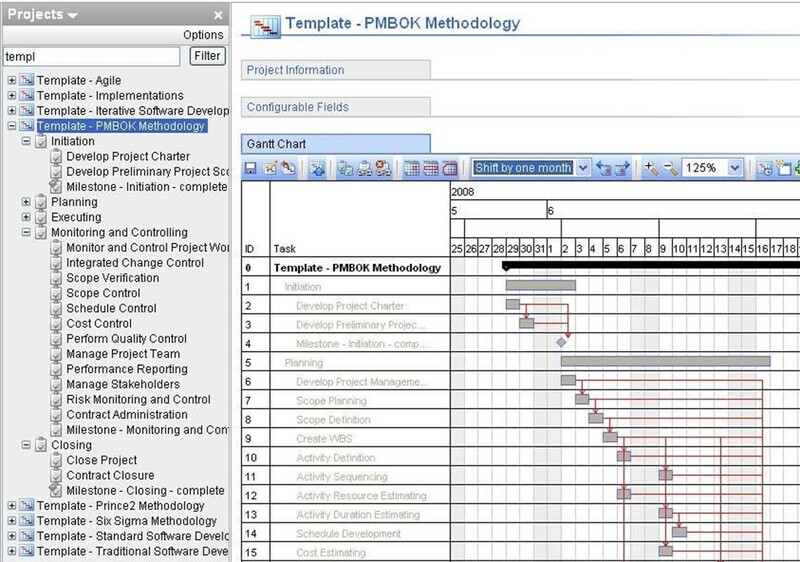 Based on standards such as PMBOK, modules exist that will assess your current project management methods and compare them with industry standards. You will be able to quickly see where your project management processes can be improved, and start to make changes. Figure 4.2 provides an example of a template based on PMBOK standards. Figure 4.2: An ITPM view based on PMBOK. In large organizations, IT can be responsible for supporting hundreds of applications across departments. In an older, established business, productivity can be tied to legacy applications that are critical to the business but no longer supported. These legacy systems may not integrate with more modern platforms and can create more problems than they solve. Companies who have grown attached to these aging systems frequently become acquisition targets as their competition out‐produces them. Mergers and acquisitions increase the number of applications that must be managed. How do you justify investing in specific applications to keep your business running? All the problems of decibel management and people with personal investments apply to this situation as well. Constantly assessing the health and performance of your applications will reduce your capital investment and decrease your TCO. By tying the results back into an IT portfolio, it becomes easy to shift your focus from utility investing to technology enhancements or frontier investments. Using ITPM and APM to manage your applications will give you a visual representation of application value and business objectives. This functionality will help you decide how to invest your resources. If certain applications begin performing poorly, their scores can be highlighted on an executive dashboard. Furthermore, this dashboard can link the application score directly to an objective or even a budget so that you can determine just how critical the issue is. With these illustrations, it is easy to invest in areas that are enhancing the business instead of acting as a utility. For example, a basic standalone CRM package may be running with a very low score while the accounting system is performing well. Since most accounting packages have a module to support salespeople and their need for access to specific information, you might eliminate the application with the lower score. Furthermore, accounting and financial packages are generally tied to utility investing. If that same software package was used by the sales force to generate revenue, it has just gained strategic value and decreased the TCO across your portfolio. There has been a recent flurry of mergers and acquisitions in just about every industry due to the economic downturn. Companies are being acquired for pennies on the dollar, and IT departments are forced to integrate two disparate systems. How can a CIO possibly know which applications will be the best investment moving forward? With APM, it's possible to quickly asses the state of the new applications and determine which are worth keeping. Information such as business criticality ratings and architectural compliance can immediately disqualify some of the acquired applications, while client satisfaction ratings and application risk ratings may point to using the newly acquired software. Regardless of which choice you make, APM data will give you a clear, concise picture of your current portfolio and allow you to make sound business decisions. In order to succeed and provide real value, CIOs must deliver the right projects at the right times. The easiest way to achieve this is to have the tools that can constantly asses the state of your IT investments, and make resource allocation decisions based on business criteria. If you have objective data, you can change course mid‐project without guessing at the results. And ITPM accelerator modules let you asses the current maturity of your business, and quickly adopt industry standards and best practices. In the final chapter of this guide, I will lay down guidelines for executive communication. I have watched over and over again while highly intelligent CIOs have lost all credibility with their executive teams. Just a few misplaced remarks can cause the dreaded "eye roll." By going back to basics, remembering to talk to your executive peers in their language and focusing on technology from their perspective, you will become a valued team member.